Damn Birds is a simple shooter game. So what makes it so unique you ask? The actual content of why you're shooting birds. 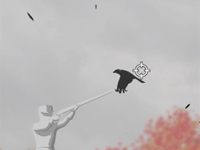 Yes, in Damn Birds you take the role of a statue in a park and demand revenge against the flying poopers by shooting them with a small assortment of guns. That's probably the only charm to this game; a funny story. After all, if you were a statue, wouldn't you want to shoot birds who gave you a smelly stain? Besides that though, everything else is quite mediocre. 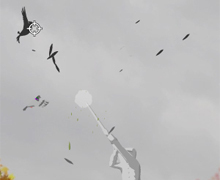 The game play of Damn Birds is simple; point and click shooting. First off, the menu is very to the point, Play, Instructions, and Highscore. The instructions are useful, but they don't explain everything. By that I mean, what defense does, how long level lasts, etc. After clicking the play button, you're taken to an upgrade room where you can purchase guns, ammo, defense, and health. After each level, you're taken to the upgrade room. Now, during the game, you are always standing in the center. You can't move obviously, you're a statue. The birds can come in from any direction, and can poop at any time. The objective is to shoot them with your gun. Seems simple right? Once you play past level 5, the game becomes increasingly harder with cleaning yourself, buying ammo, and new guns, because the birds are pooping all over you by then like crazy. Now, one gripe that's kind of bad is that you can't hit birds that fly across and into you. This is bad because you can't shoot them, and they can start plopping the dirt all over you. Ugh. Once the level is over, you receive cash based on your score (amount and type of birds killed). Casual gamers would probably find the game play difficult, because of the money issue, which can be problematic if your spending your levels cash entirely on cleaning yourself, and none on ammo. The controls are pretty easy to use. You're using the mouse to fire your gun, numbers 1-5 to switch guns, and standard pausing with the letter P. Extra controls that aren't really needed are tab, which switches to a gun with available ammo and R, for reloading, since you already reload after your ammo's gone. You may find a use for reloading before your ammo is depleted during the later stages with the SMG or Pump Gun, which carries more than 5 bullets at one time- however, by that point birds should be flooding your screen anyways. The sound effects add to the effect: there's not a lot of them, mainly you firing your gun and reloading, but at least they're there. The music, well, it's mainly silence with background chirping. Not beautiful, but it suits the game's purpose. The graphics of the game are actually very nice. The statue's movement and the birds are drawn quite nicely, which is pleasant for the eye. Those with older computers WILL experience lag during the late levels with the bird increase. So, overall, it's a great time waster as one of those games you'll be playing during a break, but never finish (because that would take full concentration, and your on a break). Yes, it's pretty much mindless killing of birds, and that's pretty much there is to it. 7.5/10 - "Good Time Waster"
Don't make the mistake of buying the shotgun after level 1. Clean yourself up and save it until level 3. I did this and died on level 2. 8/10 - "Shooters are always fun"